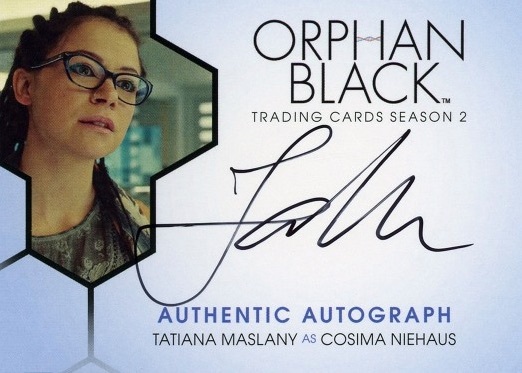 While the Season 1 release worked as a traditional set, 2017 Cryptozoic Orphan Black Season 2 opts for a premium format with three autographs and one chase insert per pack. Mirroring the show, the limited Orphan Black release is naturally based around the many personas of Tatiana Maslany in the second season. 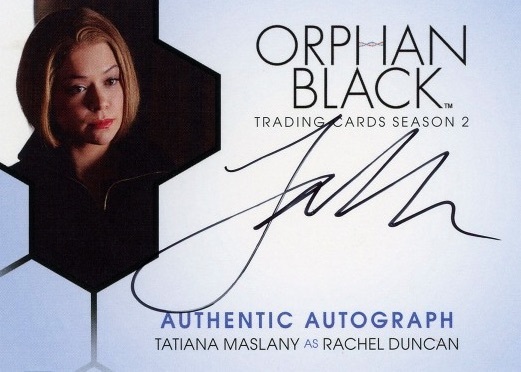 With the cast autographs coming three to a pack, the Maslany signatures are less common at around 1:4 packs. Collectors can find at least seven different characters she signed for and these are shown in the gallery below. 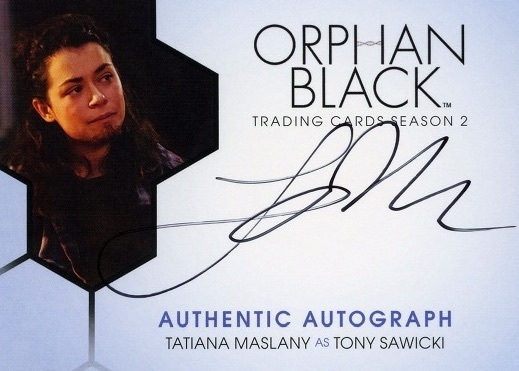 Limited Autograph Wardrobe cards for select signers including Maslany. 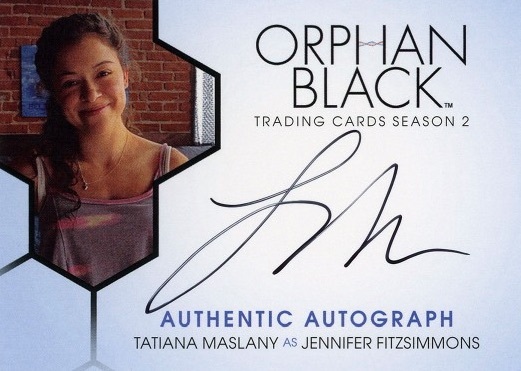 Although there is not much else to pull in Cryptozoic Orphan Black Season 2, Cryptomium Silhouettes inserts drop in every pack. Plus, there are rare redemptions for intact Tatiana Maslany wardrobe pieces. Released around the same time, a similar premium set provides coverage for Season 3. 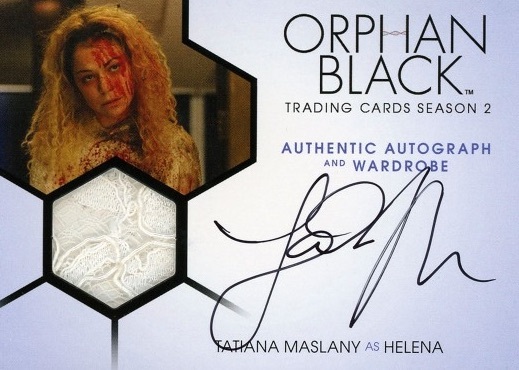 UPDATE (6/27): Moving away from traditional distribution, the premium 2017 Cryptozoic Orphan Black Season 2 packs are sold exclusively at the 2017 San Diego Comic-Con. To help alleviate the chance of being sold out, collectors can pre-order packs online starting July 6, and pick them up at the Cryptozoic booth during SDCC. Packs are priced at $50 (plus tax). Complete details are available at the Cryptozoic website. 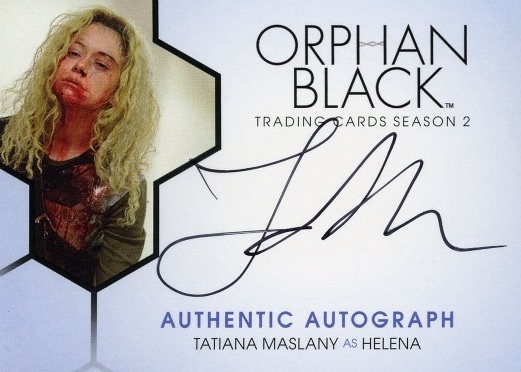 I hear that Orphan Black season 2 trading cards have been canceled. Do you know anything about this?